Nicole's Needlework: Not Sick Yet (knocking on wood)! Thank you all for your concern and well wishes. I'm still keeping my fingers crossed though! :) I went stitching today. I decided to take "Pomegranate Sampler" with me. I finished up the sampler part and now I'm working on the border - lots and lots of pomegranates to stitch! While I was there searching through some of the older charts I came across a couple of Goode Huswife charts. 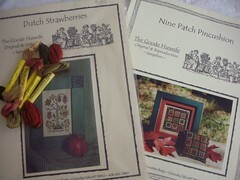 They are "Dutch Strawberries" and "Nine Patch Cushion." I got the silks for "Dutch Strawberries." 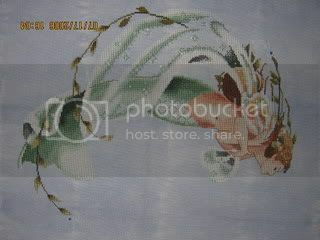 I can't wait to stitch this one - I think it's so pretty! I also stopped by my LNS (Silk Road Needle Arts) yesterday. I thought I would treat myself to some new scissors and I also picked up a couple other things that somehow jumped into my hands. 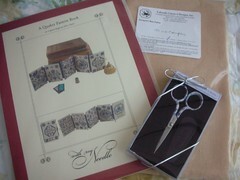 Some pretty new Gingher scissors "Julia", a fat 1/4 of 32 ct. Examplar by Lakeside, and "A Quaker Pattern Book." I do have some other news to share. Dh was offered a job with ICE as a Criminal Investigator (Special Agent). It's a dream job for him, but he has to go away for five months for training and then he will be stationed in Albany, Georgia. He actually applied in Dec. 2005! We weren't even sure we'd ever here from them! I've decided though that I just can't move again with the kids and all our family being here. I just couldn't do it to my mom, my brother (who is also my boss), my MIL. So I think we've decided to have me and the kids stay here with my mom and he'll be up there during the week and try to spend most weekends down here. It's not going to be easy, but I know we can make it work and it will be worth it in the long run. He will eventually be able to transfer to an office closer to here and will finally have a normal schedule (mon-fri). So anyway, I'm sad for me, but happy for him. If it doesn't work he can always come home and get his old job back. He's supposed to report for Training on June 18th, so that only gives us a few weeks to prepare for this! We are still talking about it, but I think he's pretty much decided that he's going to take the job. Well, not much else going on - I'm going to try to stitch a little bit. Write later! That would be so tough during the week but sounds like a job of a lifetime that he really can't say no. Good luck to your family and hope it all works out. Wow, Nicole, that sounds like quite a lifestyle change! I do hope it all works out for you. Congratulations to your husband on being selected for this job. 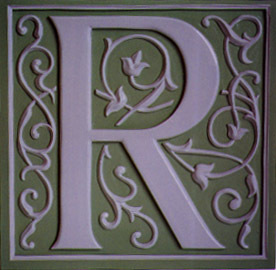 Your stitching projects are really lovely. Pomegranate sampler is beautiful. Great stash-I love the Dutch strawberries too. Congratulations to your DH and you too. It will be hard, but it will be worthwhile in the end. The five months will fly by! Hope you stay well. Congrats to DH and ((hugs)) for you. Congrats to Chris! There should be lots of work for him. When he is gone it will be like the Army again! 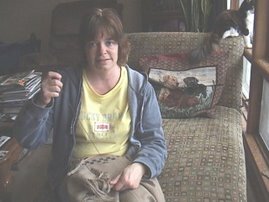 And I love the stitchy stash that your got! I have Julia's too and I love them! Pomegranate sampler is beautiful. I just love the colors. Congratulations to your husband on being selected for this job. The five months will be worth to all of you. Best wishes to your husband on his new job and I hope you all adjust to the new schedule. It's great that you have your mom and brother with you to help out! 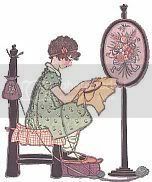 You've always got such beautiful WIPs and finishes posted on your blog. Pomagranate Sampler is coming along great and all your new stash is lovely, too! 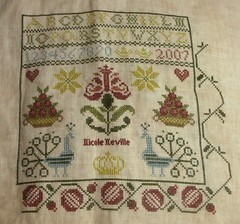 It's so nice to see Pomegranate Sampler again - I love that one! Your sampler is looking lovely. Congratulations to your DH on his new job. I can only imagine how tough it will be, but if you are both committed to making it work, things should be fine! Good luck. A sampler entirely devoted to pomegranates. That is just wonderful! You're doing an excellent job. Congratulations to your DH for getting this opportunity. I hope all goed well.